Please fill in the contact box below with your “First Name” and email address and you will see how a short series of automated emails will work. Please keep in mind this is just a mock up to give you somewhat of the experience. The series will run for 3 days straight, but when implemented can be done for any length of time. 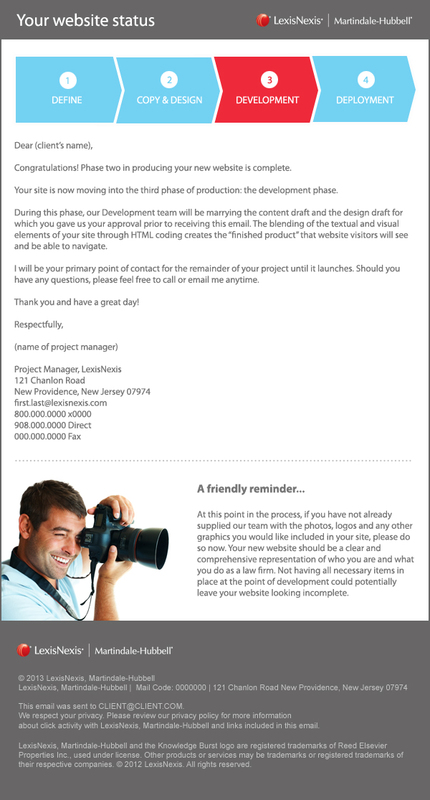 Thanks to Amanda Margitich for the email content and Mark Kosa for the sample graphical email design and structure. They were both instrumental in helping me with this small project. After the videos, you can see the email designs with some sample content. Below is an introduction to a process or strategy that I will outline for you in regards to providing a better client experience. In video #2, I will go behind the scenes and show you this can work for Lexis Nexis.